This idea is easy to make and special to receive. 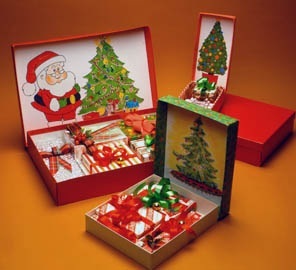 It is a Christmas tree made by you and your family and placed inside the box top. When the box top is stood on its end, all the presents in the box will be under the tree. This handcrafted tree goes inside the box lid. The first step is to plan and prepare the gifts that will be wrapped and put in to the box. If you have a missionary that loves home-baked goodies, made them and wrap and place them in the box along with the presents. Once you have the goodies and the gifts prepared to go into the care package, then you are ready to find the perfect box that will carry them and the Christmas tree that you will make. Look for a strong box that is large enough to hold all the gifts, and that has a lid that can be taken off the box. Once you have the box, take a sheet of paper that is the size of the inside lid. On the paper draw and color a Christmas tree. This can be a family project or a home evening activity. You can also sketch in the tree and leave it on a table for the next week and let everyone in the family fill in the tree so that it becomes a group effort. Once the tree is colored, glue the tree on the inside of the lid. Then put the lid on the box and send the package. You can give directions that the package be opened as soon as it is received. When the package is open, the recipients will have a Christmas tree from home to enjoy until Christmas. On and Christmas morning they can have fun opening all the gifts. Remember, it is not expensive gifts that carry the holiday spirit; it is the care and effort that goes into a gift that makes it memorable. A box of gifts with a built-in, homemade tree is the perfect item to send to someone who will not be home for Christmas. Dian has been sharing her creative ideas for more than 30 years in books, on TV and in speeches. She now has a special offer to save 60% on 5 books and 1 DVD. Get Dian’s creative library for only $40.00. Save $60 and have more than a quarter of a century of her creative and amazing ideas. This package will be great for gifts, for fun, and for kids and grandchildren. You will never run out of ideas when you have this wonderful set of books. Take advantage of this limited offer at www.DianThomas.com. Dian’s book Tipping the Scales in Your Favor shares her weight loss journey. For years Dian tried and tried to lose weight but it was not until Jackie Keller said to her in California, “I can help you lose weight,” that she caught the vision and lost more than 115 pounds. Most important, she has been able to keep it off. Get Dian’s book today and begin the journey to healthy living. Go to www.DianThomas.com to learn more.